Vegan Runner Eats » Workout Central Series » Workout Central Series: Episode 1. Full-Body Dumbbell Workout by Kelli Brantley. Today’s the day for Episode 1 of the Workout Central Series! To kick off the series, I asked my friend Kelli Brantley, a personal trainer with over 5 years of experience, to design and demonstrate a workout exclusively for Vegan Runner Eats readers. Kelli’s credentials: she graduated from the famous in Alabama Auburn University with a degree in Health Promotions. She received her personal trainer certification from Aerobics and Fitness Association of America (AFAA). The majority of her clients these days are people aged 45+, and her oldest client is an 82-year-old lady. 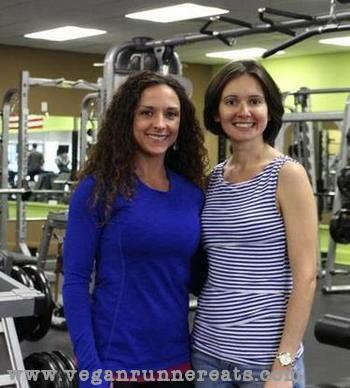 Kelli puts together customized workouts for each of her clients depending on their needs and abilities. Kelli loves to encourage others to stay active not only through her training, but also through her own example of what a fit person can do: she regularly participates in numerous races and triathlons, including an Ironman triathlon in 2013; she is currently getting ready to compete in her first fitness championship at NPC Panhandle Showdown in March 2014. Just look on the guns on this girl, I’m sure she’s going to do great! You can connect with Kelli through her Facebook page, Kelli Brantley Personal Fitness, and receive lots of positive vibes and that oh-so-needed encouragement to get off your bum and get active! (these are more convenient for renegade rows, see below). No dumbbells available? Small water bottles filled with sand will do the job. This is one round. Rest for 1-2 min, then repeat for a total of 2-4 rounds. Complete with stretching. Make it easier: skip jumping jacks and only do the above exercises in bold; do only 1-2 rounds; if regular push-ups in renegade rows are too hard for you, do the modified version (see below). Make it harder: do 4-5 rounds with jumping jacks; use heavier dumbbells; hold the plank for over 1 min. 1. Squat with Shoulder Press: 15 Repetitions (works quads, hamstrings, glutes, shoulders). Stand with feet hip width apart, toes forward; dumbbells in each hand with palms facing each other directly in front of chest (1). Lower yourself keeping weight in your heels and hips slightly back – knees should stay behind toes (2). Return to standing position pressing dumbbells up to ceiling (3). Return dumbbells to starting position. – Jumping Jacks: 20 Repetitions (Only do this for higher intensity). Stand with your feet together, your arms at your sides (1). Jump while raising your arms above you so that your hands meet above your head at the same time your feet land in a wide stance (2). Bring your arms back down to your sides as you jump your feet back together. That’s one repetition. 2. Renegade Rows: 10 Repetitions – 10 push-ups with 5 rows per side (works chest, back, triceps, shoulders, core). Start in the push-up position with your hands placed on dumbbells (1). Keeping posture in line (don’t let hips drop or rise), perform a push-up (2). Return to start (3) and pull dumbbell up to your chest making sure to keep elbow close to the torso (4). Squeeze shoulder blade and return to start repeating with the other arm (1 push-up per row for each side). Make it easier: if you can’t perform a full push-up, lower on your knees (1, see below) and follow the rest of the instructions. 3. Walking Lunge with Biceps Curl: 20 Repetitions – 10 lunges per side, 20 total curls (works quads, hamstrings, glutes, biceps). Start feet close together and dumbbells down by side, palms facing in (1). Step forward while bending both knees at 90 degree angle (2). Curl dumbbells towards chest rotating on the way up (3). Bring back foot forward pulling with front heel while lowering dumbbells at the same time. Repeat with opposite foot (alternating feet). 4. Dips: 15 Repetitions (works triceps). Seated on a bench/step/chair with your hands just under your hips (1). Keeping elbows pointing back and close together, lower your hips towards the floor (2). Keep back close to the bench and make sure to bend the elbows; push yourself up and return to start. Make it harder: keep your legs straight as you perform the dip. 5. Planks: hold for up to 1 minute (works core, shoulders, back, quads). Lying on the floor with weight on toes and elbows, raise hips up to be in a perfect line from head to toe; do not let hips drop or raise; holding abdominals in, hold this position as long as possible. Repeat the sequence 2-4 times, with jumping jacks between each exercise for higher intensity, or without for moderate intensity. Go from one exercise to the next without rest; take 1-2 min rest between each round. Finish with stretching. That’s it for today! A huge thank you to Kelli Brantley for designing and demonstrating today’s workout! Both Kelli and I would love to hear your thoughts and/or questions regarding the workout, so feel free to ask us in the comments below! Was the structure of the workout clear enough? What kind of workouts would you like to see in the future? Tagged exercise, HIIT workout, Kelli Brantley, Workout Central. Bookmark the permalink. 5 Responses to Workout Central Series: Episode 1. 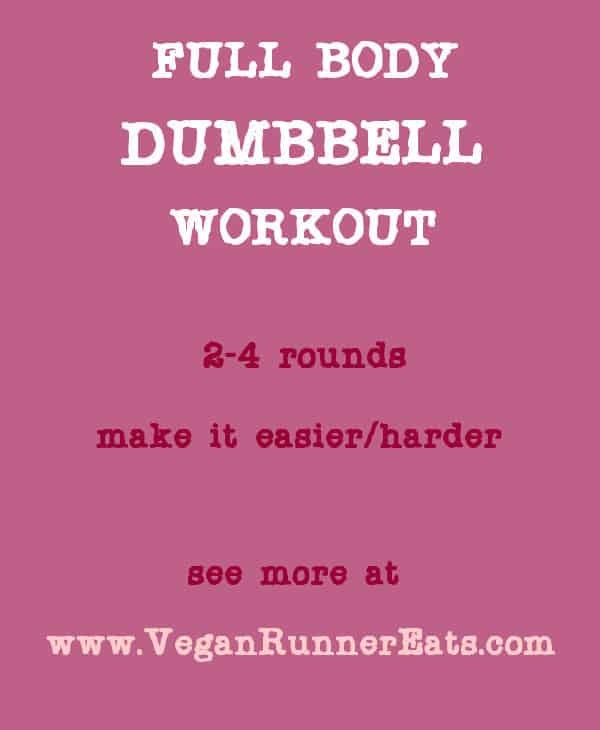 Full-Body Dumbbell Workout by Kelli Brantley. Omg! Really love the workout. You should definitely make a set of these if you get the time. I wish I can manage what you’re doing. I will keep these in mind and try them at home. Thanks for inspiring me to bet healthy and fit! You got it, Allana! Take your time, do fewer reps, go slower – as long as you keep moving, you’re moving forward towards becoming more fit!